The Beavercreek thoroughfare will be redirected to Factory Road, directly across from Yellow Brick Road. Woolpert has been contracted to eliminate this intersection of Shakertown Road and U.S. 35, and connect Shakertown with Factory Road to the east. We’re going to fix a safety concern that’s been in the area for a while. It also affects us on a personal level, since the intersection is 4 miles from our headquarters. A lot of our staff drives through the intersection. Woolpert has been contracted by the city of Beavercreek to realign Shakertown Road in Beavercreek and eliminate its intersection with U.S. 35. The revised Shakertown will connect to Factory Road to the east, in a four-way intersection with Yellow Brick Road, south of U.S. 35. 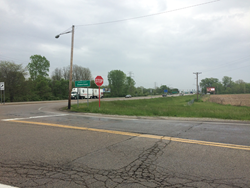 This project is part of the Ohio Department of Transportation’s (ODOT) ongoing efforts to improve the safety of U.S. 35 through Beavercreek, primarily between Factory and Orchard Lane. ODOT is moving toward more interchanges and fewer intersections along this section, and has been seeking public input. Nathan Fischer, Woolpert project manager, said the intersection of Shakertown and U.S. 35 is a dangerous one, with 32 reported crashes at that site in the last three years and 20 percent of those incurring injury. This project also will involve a slight realignment of Alpha-Bellbrook Road, which currently is part of an offset intersection with Yellow Brick. Alpha-Bellbrook will be diverted into a T-intersection with Shakertown, west of Factory. The project is in the design phase, and likely will start construction in 2020.